Christmas Stroll Is Almost Here! Christmas Stroll is this Friday! A festive event, with decorated streets and stores … store specials … photos with Santa and Mrs. Claus … free rides on the trolley, a hay wagon, a miniature train … musicians … goodies and hot drinks … all your friends and neighbors! Click here for an advance copy of the Stroll event program. If you really can’t make it downtown for Christmas Stroll, you can still join us from home – the event will be telecast LIVE on Optimum Cable TV Channel 22. And then there are the Stroll buttons…. Do you have yours yet?? Starting at the Stroll event, you’ll be checking all of the participating businesses to see if your Stroll button numbers match the unique winning number posted in each location. (The winning numbers will continue to be posted in the businesses through Christmas Eve.) If your button number matches the posted number in one of the businesses, that business will give you a prize worth at least $50. Remember to complete a registration slip for each button when you go into the businesses too – and again and again as you visit the businesses between Stroll and Christmas Eve. That’s your way to enter the new weekly drawings for $100 in Chamber Bucks. Then all Stroll button numbers plus all of those accumulated registration slips will be entered into the grand prize drawing on December 31 for $1,000 in Chamber Bucks. Click here for the list of the 103 participating businesses (also listed on the back page of the program above). You can purchase your buttons from any of these businesses; if they’re sold out of buttons, call the Chamber to find out who still has some remaining. 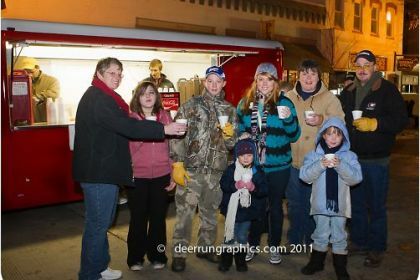 Christmas Stroll is brought to you by a special committee of the Sheridan County Chamber and the Downtown Sheridan Association, and by our wonderful sponsors, participating businesses, and many volunteers.